-Colorado. One of the three remaining Bush/Obama states that we haven't polled yet. Interested to see if Obama's holding on in the state but beyond that would definitely need your suggestions on what to ask there without a race for Senator or Governor in 2012. -Connecticut. Not interesting at the Presidential level but we have about 42 million permutations for the Senate race there next year that we could look at. -Georgia. This is one of the few states Obama didn't win in 2008 that he could conceivably pick up next year- although certainly only in a landslide. Particularly interested in seeing how Gingrich's home state reacts to a potential bid. Like Colorado would need suggestions on what else to ask without a marquee down ballot race in 2012. -Missouri. We already polled Missouri in early December but we're willing to take a look at it again already because the nature of the Senate race has really changed with Jim Talent not running and a bunch of new Republican names on the table. Also interested in seeing if the nationwide resurgence in popularity Obama had over the course of January now has him in better shape for taking Missouri next year. -New Hampshire. Main interest here, like last week, is seeing what impact Rudy Giuliani getting into the Presidential race would have in the state. And also if the huge Republican year in the state bodes poorly for Obama's reelection prospects next year or if that was just a blip on the radar. -New Mexico. Another of the Bush/Obama states that we haven't made it to yet although given his 15 point victory in the state in 2008 I have a hard time thinking it's going to be competitive next year, even with Susana Martinez's strong performance for Governor last year. Also a potentially interesting Senate race, particularly if Jeff Bingaman decides to hang it up. -Washington. Maria Cantwell and Debbie Stabenow both won extremely close races against incumbents in 2000, then cruised to reelection in the Democratic wave year of 2006. Barack Obama won both of their states by about the same margin. Stabenow looks like she might really be in trouble for reelection. Is Cantwell? BTW for the purpose of keeping the survey at a reasonable length we would skip the Governor's race for now and just stay focused on President and Senate. You can add Nebraska to the list of 'Sarah Palin swing states.' She leads Barack Obama there by only a single point at 45-44. If the Republican candidate for President next year is any of the other current front runners the state should remain in the red column where it's been reliably for years. Newt Gingrich leads him by 8 in the state (48-40), Mitt Romney leads by 12 (49-37), and Mike Huckabee is ahead by 13 (51-38). Romney and Huckabee's advantages are pretty comparable to the 15 point margin John McCain won the state by in 2008. Obama's not particularly popular in the state, with only 38% of voters approving of him and 56% disapproving. But with the exception of Huckabee voters aren't all that enamored with the leading Republicans either. 50% of voters have an unfavorable opinion of Palin to only 42% who see her in a positive light. Gingrich's numbers aren't much better with 43% rating him negatively to only 34% with a favorable opinion. Romney has net positive numbers by the slimmest of margins- 38% favorable and 35% unfavorable. Only Huckabee has real good personal numbers as 44% of voters have a positive opinion of him to 33% with a negative one. Obama won an electoral vote in Nebraska in 2008 by taking the state's 2nd Congressional District and he would do so again if the election was today by a pretty healthy margin. His approval rating there is a positive 51/45 spread and he leads Romney by 9, Huckabee by 11, Gingrich by 19, and Palin by 24 there. The state may change the way it dispenses its electoral votes and there will probably be some changes in the district boundary lines but at least for now it looks like he would pick up a spare vote there just as he did the last time around. Nebraska is certainly not going to be a swing state any time soon but it's a definite sign of weakness for the Republican field that voters don't think much of the leading potential candidates in one of the reddest states in the country. If Nebraskans don't like the GOP contenders you certainly can't expect that folks in Ohio or Florida or Virginia are going to. It will be interesting to see over the course of 2011 if anyone can emerge from the back of the pack with greater appeal to the voters- if that doesn't happen Obama could end up coasting to reelection. North Carolinians have complex feelings about the health care bill passed last year that don't fall simply into either the 'repeal' or 'don't repeal' categories. Only 33% of voters in the state support a full repeal of the bill. Another 21% are in favor of repealing certain parts of the bill, but not the entire thing. That's consistent with PPP findings during the debate about whether to pass it last year-while North Carolinians said they were opposed to the overall bill they were very supportive of several of its major provisions. The largest group of voters in the state, at 36%, actually wants the bill not just to stand but also to be strengthened. Only 7% want the bill to be kept intact exactly in its current form. Legislative Republicans are in line with their party base by supporting a full repeal- that's the stance of 62% of GOP voters in the state. They are not, however, on the same page as independent voters whose overwhelming support of Republican legislative candidates gave the party its new majorities. There are more independents- 35%- who want to see the health care bill strengthened than there are- 33%- who would like the bill to be completely repealed. This issue is a great example of where Republican could cause themselves trouble this year by over reading their mandate. Independents may have voted for them last year but that didn't mean they agreed with everything in the GOP agenda and this is a case where there's some tension between the priorities of the new majority and the voters who made it possible. Many more issues along these lines will crop up over the course of this year's session and how the Republicans handle them may determine whether their new power lasts only for two years, or for many more years to come. We're going to have polls out in Arizona and South Carolina next week as well as a few surprises we haven't said anything about yet. It's time to do another round of nominations for the two states where we'll poll next weekend. We'll pick some finalists out of the suggestions you give us over the weekend and then have a vote starting Monday. Here are the states we have already polled since November. We're not going to start repeating states for a while: Virginia, Montana, North Carolina, Massachusetts, Ohio, Wisconsin, Michigan, Minnesota, Florida, Pennsylvania, Nevada, Iowa, New Jersey, Texas, Arizona, Wyoming and South Carolina. The one state we are willing to poll again is Missouri because a lot has changed there since we polled in early December. So if you're interested in that let us know and we might put it in the mix for next week. Beyond that tell us where you want to see a poll and what you want us to poll there, thanks as always for the great suggestions! The Democratic primary for Governor of West Virginia, if indeed there is one, will start out highly competitive. Things are a lot more cut and dried on the Republican side. Acting Governor Earl Ray Tomblin and Secretary of State Natalie Tennant, at 25% and 24% respectively, are the early front runners to win the Democratic nomination. Treasurer John Perdue is within striking distance at 16%. The other folks most seriously considering the race are stuck in single digits- Senator Jeff Kessler at 7%, House Speaker Rick Thompson at 6%, and Senator Brooks McCabe at 4%. A lot of these early numbers can be explained by name recognition. Tomblin and Tennant are each known to 67% of Democrats in the state, while Perdue's at 53%, and Thompson's at just 36%. We didn't test favorability for Kessler and McCabe but they are probably similarly or less well known as Thompson. If the folks back in the pack right now raise a lot of money and are able to run highly visible campaigns they'll pull closer. There's a clear ideological divide in the way voters are leaning right now. Tennant leads Tomblin by 11 points with liberals and 3 with moderates. But Tomblin has the slightest of leads overall because of a 15 point edge over her with conservatives who are actually more numerous within the West Virginia Democratic ranks than liberals, one of the few states where that's the case. There's also a gender gap in the numbers with Tennant ahead by 4 points with women but Tomblin holding an 8 point advantage with men. Bottom line on the Democratic primary: it's going to be competitive. That does not appear to be the case on the Republican side. If Shelley Moore Capito reverses course and decides to run for Governor this year, the nomination is hers for the taking. But barring that Betty Ireland is an overwhelming favorite. 72% of GOP voters say they would want Capito to be the nominee if she ran with only 10% preferring Ireland over her. Clark Barnes is at 5% with Capito in the picture and Mark Sorsaia and Mike Stuart each barely register at 1%. Capito's favorability rating with Republican primary voters is a pretty remarkable 78/9 spread and the gap between her and Ireland makes it very clear who the most beloved Republican in the state is. Capito doesn't seem likely to enter though and if she doesn't Ireland has a similarly dominant lead over the field, registering as the first choice of 46% of Republican voters to 11% for Barnes, 9% for Sorsaia, and 4% for Stuart. Name recognition is an issue here too with Ireland known to 49% of GOP primary voters compared to only 21% for Barnes and 17% for Stuart, but that still leaves quite a hill to climb for the other Republicans interested in running. We don't know whether there's even going to be a primary but if there is things look a lot more settled on the Republican side than they do for the Democrats. New PPP polls on the Republican Presidential race in North Carolina and West Virginia confirm a couple of the continuing trends we've been seeing in our numbers so far in 2011: Mike Huckabee leads most places, Mitt Romney has serious issues with conservatives and in the South, Sarah Palin's popularity with the GOP base doesn't equate to its wanting her to be their nominee, and Newt Gingrich is just kind of hanging around. In North Carolina Huckabee is the top choice of 27% of Republicans in the state to 18% for Gingrich, 16% for Palin, 11% for Romney, 7% for Tim Pawlenty, 6% for Ron Paul, 3% for Mitch Daniels, and 1% for John Thune. Huckabee is tops in West Virginia as well with 28% to 23% for Palin, 17% for Gingrich, 10% for Romney, 6% for Paul, 5% for Pawlenty, 2% for Daniels, and less than 1% for Thune. PPP has now polled 7 states in 2011: Iowa, Nevada, Texas, Pennsylvania, and New Jersey in addition to these two. Huckabee clearly has the momentum- he's led outright in 5 of the states and tied in a 6th. Meanwhile Romney has managed to lead in only one state while tying in another and Palin and Gingrich each lead nowhere. One of Palin's biggest issues right now is the disconnect between Republicans liking her and supporting her. She has the highest favorability of the leading GOPers in North Carolina at 72%, with Huckabee at 70%, Gingrich at 62%, and Romney at 50%. But she's still 11 back of Huckabee and a couple behind even Gingrich in the horse race. She has a long way to go to convince the party base that she's Presidential stock. The news is worse for Romney than Palin though. He is in a distant fourth place in both of these states, as he was in a Texas poll we did last week. That suggests limited appeal in the delegate rich South. Beyond that his poor performance is yet another sign of his comparatively poor appeal to conservatives. In North Carolina Romney's favorability with them is anywhere from 17 to 26 points worse than his fellow contenders. It's 52% to 69% for Gingrich, 73% for Huckabee, and 78% for Palin. It's a similar story in West Virginia. There he runs anywhere from 9 to 34 points behind the rest of the pack at 60% to Gingrich's 69%, Palin's 75%, and Huckabee's 84%. Given his lesser popularity it's no surprise that his horse race standing with conservatives is a weak 10% in West Virginia and 9% in North Carolina. These states aren't likely to be real important to the GOP nomination contest, but they exemplify larger problems for Romney. Next week we'll have numbers out in the really important southern state: South Carolina. Most North Carolinians aren’t following the ongoing controversies with the Wake County School Board but those who are have an unfavorable opinion of the body and think that it’s hurting the state’s image. 61% of voters in the state don’t know enough about the situation with the School Board to have an opinion but among those who do 25% rate it unfavorably to only 14% with a positive view. There’s an even stronger sentiment that the body’s actions are damaging the state’s reputation in the eyes of the nation- 30% think North Carolina’s getting a bad image because of its actions to only 12% that believe it’s making the state look good. Voters in the Triangle unsurprisingly have much stronger opinions on the School Board than folks statewide and their reviews are extremely negative. Just 29% of those being exposed to the controversy on a day to day basis in the media have a favorable opinion of the board to 51% who have a negative one. And 56% within the region think it’s making the state look bad on the national stage to only 22% who think it’s helping. Of course statewide public opinion and even public opinion in the Triangle doesn't much matter if the composition of the School Board is again determined this fall by a very small subset of Wake County voters who bother to get out to the polls. But after the high profile drama of the last year it seems likely turnout will be a lot higher this time around than it was in 2009. As decision day comes closer and closer North Carolinians are unified: they want the 2012 Democratic convention to be held in Charlotte. 63% of voters in the state hope the DNC will be here next year to only 18% who are opposed to the idea and 19% who don't care either way. There's a bipartisan consensus for bringing the convention to the state. Unsurprisingly Democrats give it its strongest support, with 81% in favor to only 7% opposed. Independents are also overwhelmingly in favor it, by a 66/15 margin. Republicans are less sold on the idea but still have a plurality in support, 39/34. In addition to there being support across party lines for the convention, there's also momentum well beyond the greater Charlotte region. Certainly that's where the desire to host the convention is highest at 68% but there's also very strong backing for it in the rest of the state- 67% in the Triangle, 62% in the Triad and the Mountains, 61% in the southeastern part of the state, and 57% in the northeastern part think it would be good for Charlotte to win hosting honors. Public opinion probably isn't a big part of the site selection process but this much is clear: North Carolinians of all stripes will welcome the convention with open arms if Charlotte does indeed get the nod. 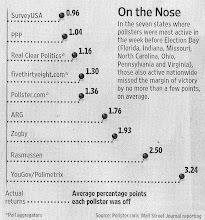 The winners of our vote on where to poll next week were Arizona and South Carolina. Would appreciate question suggestions for those two states. Most interested in getting ideas for who to test against Jon Kyl for the Senate in Arizona. As we said earlier this week we are not going to poll Gabrielle Giffords. If she gets well and expresses interest we can certainly do it further down the line but for now we don't think that's real appropriate. We'll definitely do Janet Napolitano and beyond that would appreciate your suggestions. Any other ideas for things we should ask in those two states would be appreciated as well, thanks! West Virginia's one of the most conservative states in the country. But even there voters don't like any of the leading Republican candidates for President, with the exception of Mike Huckabee. It's yet another sign that the current front runners have limited appeal and that the party might be better off with someone else emerging from the pack of currently second tier candidates as their nominee next year. Huckabee's favorability in the state is a 48/27 spread. But the rest of the pack all have negative favorability ratings. Mitt Romney's at 34/37, Sarah Palin's at 41/47, and Newt Gingrich is at 33/43. Of course none of the Republicans are nearly as unpopular as Barack Obama in the state and there doesn't appear to be any real chance of Democrats returning it to its former blue state status in 2012. Only 34% of voters approve of the job Obama's doing to 58% who disapprove. Obama's complete lack of support with Republicans and independents is no surprise, but even with Democrats his approval breaks down only as a 50/40 spread, certainly the worst numbers we've found for him within his own party anywhere in the country. That's a reflection of West Virginia having probably the most conservative group of Democratic voters anywhere in the country. Still because the GOP candidates are so weak Obama either matches or exceeds his performance from 2008 against 3 of his top 4 potential competitors. Against Romney he trails by 13 points at 50-37, identical to his margin of defeat against John McCain in the state. He improves slightly on last time against Gingrich, trailing by 10 points at 49-39. And West Virginia comes close to earning swing state status if Palin's the nominee- Obama trails her by just 4 points at 46-42. Only Huckabee can take advantage of the President's unpopularity in the state and build on the Republican margin of victory from 2008, leading Obama by 18 points at 54-36. Whoever the GOP Presidential nominee is in 2012 will doubtless carry West Virginia. But the numbers in the state still tell us something- that as rough as the sailing's been for Democrats over the last couple years none of the Republican front runners, with the possible exception of Huckabee, can really build on the party's performance from 2008. That's bad news for their hopes of knocking off Obama. Bev Perdue continues to trail Pat McCrory in a hypothetical reelection contest, but as her approval numbers have improved over the last few months she's beginning to close the gap a little bit. McCrory leads by 7 points at 47-40. That represents a five point gain for Perdue since she trailed by 12 in a November PPP poll at 49-37. The biggest key to Perdue's improvement is a resurgence with independents. Where she trailed McCrory by 31 points with them a couple months ago that margin is now down to 10 points. Independents were strongly supportive of the government reorganization plans that Perdue put forward to much attention a month ago and the Governor is also probably benefiting from a general warming toward Democrats from those voters since the beginning of the year. Numerous recent polls have found Barack Obama with his best numbers among independents since early in his Presidency. Perdue's 10 point deficit with independents is actually almost identical to the 7 point loss with them we found on our final North Carolina poll in 2008. The main reason Perdue is running poorly compared to the last election is mediocre numbers with Democrats. She leads only 65-21 with them right now where she had an 80-17 advantage the last time around. Perdue's lackluster approval numbers since she took office can be blamed more than anything else on her relatively poor standing with Democrats. Finding a way to keep the party base in line over the next 21 months is probably the key to her winning a second term. Meanwhile McCrory continues to be well liked at least with the voters that still know who he is. A plurality in the state at 45% have no opinion of him either way but among those who do 33% rate him favorably to 22% who see him unfavorably. His favorability runs 4:1 positive with Republicans at 43/11 and impressively there are almost as many Democrats- 26%- with a positive opinion of him as a negative one- 27%. A few rounds of negative advertising would likely plunge his favorability numbers across party lines pretty darn quick, but at least for now he's doing well on that front. If the election was today Perdue would lose, pretty much no doubt about that. But it's not and I think some folks have been a little quick to write her political obituary. If she's gained five points on McCrory in two months, well out from the election, then it's certainly possible that she could make up the other seven in the next 21 months. It's not going to be easy by any means but it's too early to write her off. West Virginia may be having its election for Governor in October, but which party will emerge holding the office may be decided much earlier in the year than that. If Shelley Moore Capito enters the race she will be the immediate front runner and give Republicans a great chance to take the office for the first time in more than a decade. But if she doesn't run either of the Democratic front runners- acting Governor Earl Ray Tomblin or Secretary of State Natalie Tennant- would be a strong favorite over the rest of the GOP field. Capito is by far the best known and best liked of the possible candidates. 54% of voters in the state have a favorable opinion of her to only 30% with an unfavorable one. She starts out with leads ranging from eight points over Tomblin at 48-40 to 12 over Tennant at 49-37 to 19 over Treasurer John Perdue at 52-33 to 25 over House Speaker Rick Thompson at 54-29. She has a great deal of appeal to Democrats, winning anywhere from 29 to 34% of their vote across the four match ups and also is very strong with independents, leading the Democrats by margins of 23-39% with that voter bloc. If Capito gets in she will certainly be the favorite. Republican chances of winning don't appear to be very good without Capito in the race though. Tomblin has good approval numbers for his short stint as Governor so far- 42% of voters like the job he's doing to only 20% who disapprove. He swamps the GOP contenders, leading former Secretary of State Betty Ireland by 17 points at 49-32, state senator Clark Barnes by 32 at 54-22, and GOP chair Mike Stuart by 33 points at 53-20. Tomblin wins over more Republicans than he loses Democrats in each of those match ups, a definite formula for victory in a state where the overwhelming majority of voters are Democrats to begin with. Earning co-front runner status on the Democratic side with Tomblin is Tennant. She has comparable name recognition to him and is also overwhelmingly popular with the voters who know her- 43% rate her favorably to only 19% with a negative opinion. She leads Ireland by 11 points at 43-32, and Barnes and Stuart each by 26 points at 49-23 and 48-22 respectively. The other 2 Democratic candidates we tested are unknown to a majority of voters in the state- 52% don't know enough about Perdue to have an opinion and that rises to 66% for Thompson. Both of them lead Barnes and Stuart. Perdue has an 18 point advantage over Barnes and Thompson a 10 point one, while Perdue's edge over Stuart is 20 with Thompson up 11. That duo has some difficulty with Ireland though- Perdue ties her and Thompson trails her by 6. The state of the race at this juncture is pretty straight forward- Capito is the front runner if she gets into the race, Tomblin and Tennant are co-front runners if she doesn't, and Perdue and Ireland have the potential to be competitive but need to build up their name recognition. It looks like a pretty up hill battle for Thompson, Barnes, and Stuart at this point.